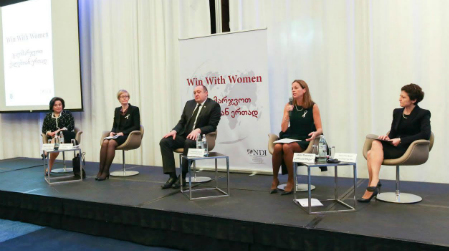 “Women’s greater participation in politics is an indispensable condition for a country’s effective, democratic and stable development,” said Georgian President Giorgi Margvelashvili as he opened NDI’s Win with Women conference in Georgia’s capital Tbilisi. The December 2014 conference brought together Georgian political parties, government institutions and citizen groups to identify ways for women to get more involved in politics, particularly by pushing for mandatory gender quotas for the national parliament. Georgia lags behind many countries when it comes to women’s political participation. Women hold only 11 percent of the seats in the 150-member national parliament and 21 percent of seats in the government’s executive cabinet. 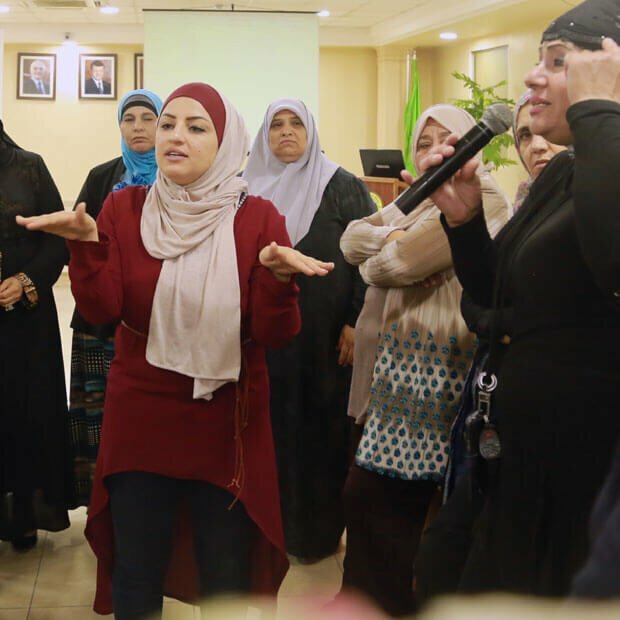 At the local level, women account for only 11 percent of recently elected local councils, and there are no women mayors in any of Georgia’s 12 self-governing cities. Out of 59 communities, only one chose a female chief executive in 2014 local elections. Despite these numbers, gender equality continues to rise as a priority issue in Georgia. 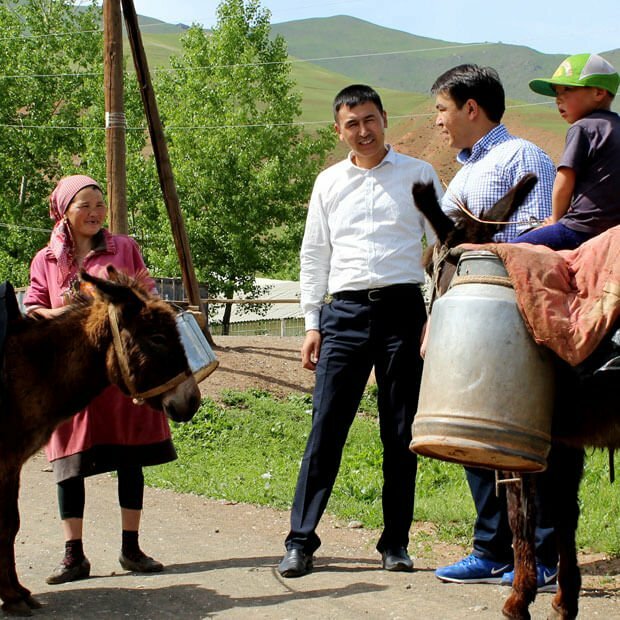 According to a recent NDI public opinion poll, 68 percent of those surveyed said they supported mandatory gender quotas for parliament and 70 percent said the parliament should have a minimum of 30 percent women. Further, 50 percent said that increasing the number of women in parliament would have a positive impact. Win With Women Panel: "Win with Women" Conference, December 2014. Pictured (l to r) Manana Kobakhidze, vice-speaker of the Georgian parliament; Martina Quick, ambassador of Sweden; Giorgi Margvelashvili, president of Georgia; Laura Thornton, NDI country director; Thea Tsulukiani, Georgian minister of justice. The conference also gave Georgia’s Gender Task Force on Women’s Political Participation the chance to present a unified voice in support of more women in politics. 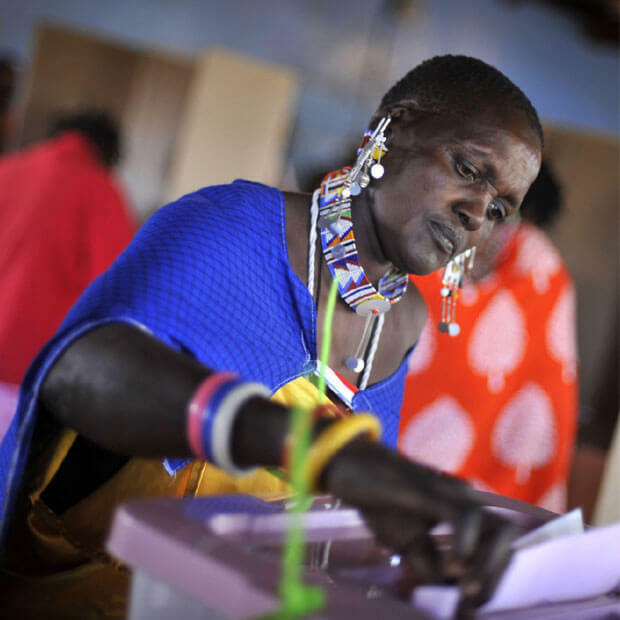 Established in 2014, the multipartisan task force brought together representatives of political parties, civil society, members of parliament and the international community to promote women’s participation in politics. The task force has played a significant role in raising awareness in Georgia on gender equality and mobilizing support nationwide against domestic violence. In June 2014, the task force launched a legislative initiative to require a mandatory 50 percent gender quota in national party lists for the parliament. NDI and its partners have held a series of meetings with party leaders, ministers and parliamentarians to provide recent polling data on the Georgian public’s favorable views toward gender equality and sharing experiences from other countries. This month, the Gender Task Force submitted their legislative initiative to the Georgian parliament supporting gender quotas. The proposal must be put forward by an MP for initial discussion within a parliamentary committee before it is considered a proposed legislation. If it is approved, 38 women out of the 77 members of parliament will be selected from party lists in the upcoming 2016 parliamentary elections. The proposal is currently under consideration. The Win with Women conference was attended by more than 70 participants, including members of parliament, political party leaders, members of the Tbilisi city council and representatives of local and international nongovernmental organisations. The conference was supported by the Swedish International Development Cooperation Agency.